Even if your business is small, the threat of cyberattacks is massive. Forty-three percent of cybersecurity attacks are aimed at small businesses, and this number is expected to increase. 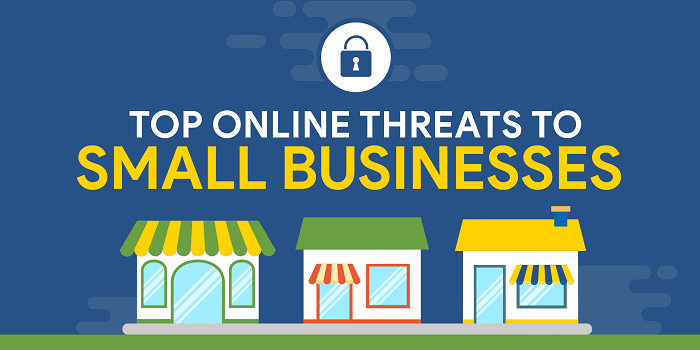 Our latest infographic provides statistics on the top cyber threats on small businesses and how you can protect yours. This is malware that is embedded within files, such as Microsoft documents. In 2017, 269 billion emails were sent and received. 39% of those were spam. Download attachments only from emails you trust. Check for discrepancies and irregularities, such as misspelled words. Disable macros in Microsoft applications. This is malicious software that steals banking credentials and/or credit card information. Bookmark trusted and frequently-visited websites. Directly type the bank’s website address as a precaution. Enable additional authentication measures, such as 2FA, if available. This is malware downloaded from compromised sites or infected files that locks a device until a ransom is paid. Beware of suspicious emails with urgent requests for personal information. Avoid opening unknown email or embedded links. Regularly update software to patch vulnerabilities.